John McNichol, president and CEO of the Pennsylvania Convention Center, speaks during an announcement that volunteers can register for the pope's visit. As executive director of the World Meeting of Families, Donna Farrell receives a lot of questions from the public. None of them, she insists, is more popular than asking how someone can volunteer. "You would think the No. 1 question would be, 'Can I see the pope?'" Farrell said. "It's not. It's 'What do you need? How can I help?' I get overwhelmed by the number of people who say they want to be part of this." The World Meeting of Families opened volunteer registration Monday, launching a website dedicated to enlisting the 10,000 volunteers needed to run the event and its ensuing papal visit. Volunteers can register at www.worldmeeting2015.org, where they must answer several questions gauging their interests and agree to a criminal background check used by the Archdiocese. Volunteers will receive a verification email within 48 hours asking them to volunteer their services at more than 100 events. Volunteers are needed to serve in six major roles — as volunteer captains, special service coordinators, digital media diplomats, in guest services and in operations and logistics. The event runs from Sept. 22 to Sept. 27. About 300 to 500 volunteers are needed to serve each day at the World Meeting of Families at the Pennsylvania Convention Center. An additional 7,500 are needed during the weekend, when Pope Francis will celebrate Mass on the Benjamin Franklin Parkway. That event is expected to attract as many as 2 million people. "The enthusiasm and the interest in volunteering has been so overwhelming," said Suzanne Kinkel, director of volunteers. "In the past four months, I can tell you that we have personally answered between 2,000 to 3,000 letters and emails that have come in to us wanting to know when is volunteer registration opening." The World Meeting of Families particularly needs volunteers capable of greeting guests who speak foreign languages, Farrell said. The event is expected to bring 15,000 participants from 150 countries. "We are going to have people streaming into this region," Farrell said. "We need people at 30th Street, at the SEPTA locations, at the airport, who will be able to greet them in English, Spanish and all kinds of other languages." Farrell also said event organizers also seek volunteers willing to serve as "digital diplomats" showcasing the event across social media platforms. "I think that's going to be huge, that part of it," Farrell said. 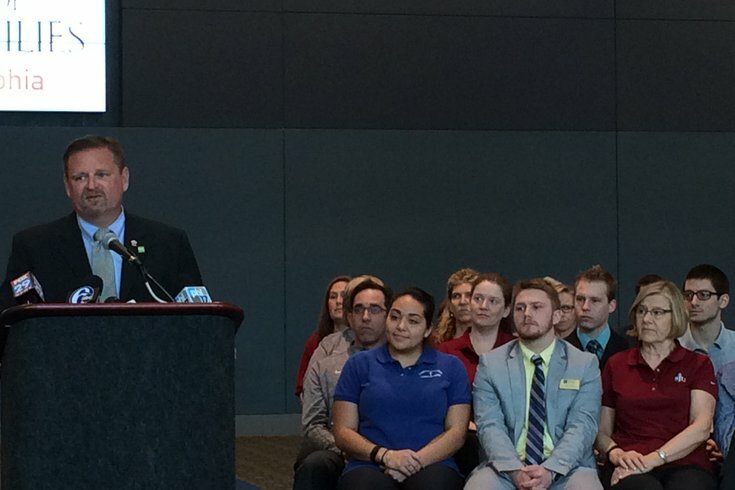 Dozens of volunteer leaders from local corporations and universities gathered as the backdrop for the announcement, held at the Convention Center. Aramark, Campbell Soup Co., Independence Blue Cross and Tourcon each pledged to send teams of volunteers. So did Cabrini College, Neumann University, St. Joseph's University and Villanova University. Karen Lewis, a Campbell's volunteer leader, said it is personally important for her to help during the papal visit. She did not know her exact volunteer capacity, but she was excited to assist wherever necessary. Rich Tutak, a senior at Neumann University, said his school instilled the value of service. Tutak, who will be a Neumann alumnus by the pope's visit, said he wanted to help out with guest services. Staff reporter Michael Phillis contributed to this report.